My post for July 8 showed two photographs that included a large number of unidentified early women library workers. One of the photographs was on a postcard which was mailed from Aurora, Illinois. The current staff of the Aurora Public Library have now identified the photograph as one that shows an earlier group of staff members at the Aurora Public Library. The image above is an enlarged detail of the women on the postcard with their names. One of the women pictured is Lillian C. Miles, the Assistant Librarian. James Shaw, the Librarian, is not shown. The Aurora Public Library was founded in 1881. James Shaw became the Librarian in 1884. 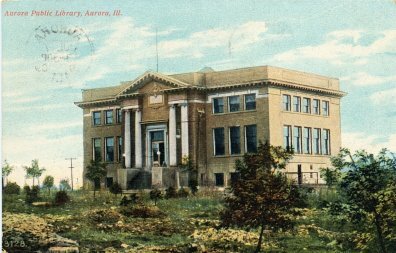 In 1904 the library moved into a new building (shown on the postcard below) funded with a $50,000 grant from Andrew Carnegie. The photograph of the women library workers was taken sometime between the date the Carnegie library opened and the date the postcard was mailed (July 10, 1907). The building was drastically remodeled and expanded in 1969. The remodeling included a new facade for the building. Hello! I was wondering if I could use your Aurora library postcard image on a historical timeline that I'm putting together for the City of Aurora. If so, please let me know how to credit you. Linday, Yes you have my permission to use the postcard image. Credit "Courtesy of Larry T. Nix" is fine. If you would like a higher resolution image contact me at nix@libraryhistorybuff.org. Great, thank you! Our historical timeline has only small images, so the size from your webpage should be great. I'll let you know when it is published.